It’s no secret that I’m a complete sailing addict and have been for most of my life. The very first time I went out on a sailing dinghy, I was around 14 or 15 years old and it was with my lovely brother, Alan, who was then teaching youngsters to sail at Raven’s Ait sea cadet centre in Kingston. He took me out in a Jack Holt GP14 dinghy – at that point one of the most popular general purpose (that’s where the ‘GP’ came from) boats around. I will never forget the sensation as he managed to get the boat up on the plane in a pretty strong wind – it felt like we were flying – and I’ve been in love with the sport ever since. Eventually, I acquired my own first boat – an Enterprise called ‘Bagus’ that had certainly seen better days – but I learned an awful lot from that old boat – mainly how NOT to sail. Towing Bagus behind the car, my wife, Julie, and I took our children and their grandmother off to Southwold in Suffolk for a family holiday and I confidently took Julie out for a sea sail. It was invigorating with a pretty stiff breeze blowing until I came to tack for the first time whereupon I managed to capsize us with Bagus ending up completely upside down in the water and Julie exhaling large quantities of the North Sea. It took quite a time to get the boat upright again and my good lady was less than impressed with my helmsmanship. To say I was embarrassed was a minor understatement. Over confidence on the water is a very dangerous thing and I eventually returned to shore a much wiser man. So I can heartily recommend a book that has just been published called ‘Learn To Sail’ written by Chertsey resident Tim Hore, himself a qualified RYA Senior Dinghy instructor and a member of Littleton Sailing Club in Shepperton. 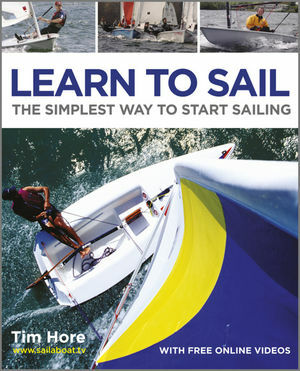 The book is a real treasure – as Tim says in his introduction, it’s a perfect partner for anyone wanting to get into a sailing dinghy for the first time or for those who want to get back into the sport and simply need a refresher. In plain and simple language and lavishly illustrated with hundreds of pictures, Learn to Sail starts right from the basics, explaining the names of all the ropes and parts of the boat, knots used regularly on a dinghy and how to tie them, sailing conditions, safety, the weather, launch and recovery operations and much more. The chapters devoted to sailing techniques, tacking, gybing and rules of the road are particularly valuable and I wish I’d read the section on recovering from a capsize before I headed out into the North Sea – it would have saved a lot of marital friction! Learn to Sail is published by Wiley Nautical (ISBN 978-1-119-95276-3) and costs £12.99. Tim also runs an associated website called www.sailaboat.tv, which offers useful videos on the subject.